Back when I was just a fresh-faced young blogger (about two months ago), just starting out with my daily posts and preparing my face for the moustache-growing endeavor that is Movember, I learned that Just for Men hair products was looking for facial-hair-friendly bloggers willing to review the product line. When the package arrived, I got a little worried. I had thought the Just for Men product line would include moustache waxes or similar products, but it was actually their complete line of hair coloring, from sandy blond to real black. I knew that Just for Men did hair coloring, but I figured a product line involved something more. It was my first product review, and I was already fumbling around. I let the go-between company know that I was sorry, that I didn’t actually have any gray in my moustache—though I do have some on my temples. They were cool with the situation and encouraged me to move forward however I thought best—but to keep the coloring on my facial hair, if I chose to use it. The stuff I got is formulated especially for coarser hair (though a warning inside the box said to not use it on body hair; I didn’t ask whether Just for Men has a product line for, uh, anything below the neckline—or below that). I decided to take my dark brown moustache to black and, time and skills permitting, attempt to shave my facial hair into the Batman logo. But first, my brother-by-choice—who does have a little gray in his facial hair, even though he’s a year younger than me—agreed to get in on the action, too. My review is supposed to be my own, but as I’ll still be posting my own thoughts, I thought this would be an OK write-up. He and I bleached our hair together years ago when we were roommates, and we’ve given each other haircuts (buzz cuts, but still), and we shared a bathroom mirror for shaving for a few years during and after college. We’re old hats at this. You can see some gray just under his lip and to the right. His wife likes it, but he still wanted to give the coloring a try. The application is super easy and quick, and the package—he chose dark brown—even comes with disposable gloves. I mixed the coloring up in a little plastic tray (also included), he brushed it in, we waited five minutes, and he shampooed it out. That’s it. He liked how it turned out. 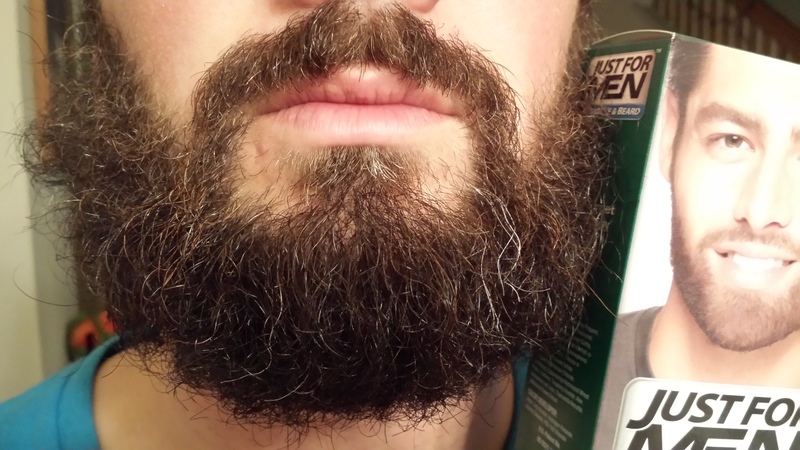 The single application made the gray strands take less of a spotlight. I asked if he would have wanted a darker color or a second application, but he said no. After he and his wife left, I turned to my own moustache. I’d let more of a full beard grow after Movember ended, but I was ready to scale back again. I change my facial hair a lot anyway. As you can see below (despite the weird lighting), I’ve got dark brown facial hair. I like it. I had got some of the coloring on the skin around my moustache and wiped it off as best I could, but there are still some stains as I write this. I’m sure they will fade. That’s totally not something I would typically worry about. With my moustache blackened like a Louisiana catfish, I started the fine tuning. My tools: two straight razors, a detail trimmer, and a copy of the Batman logo. A few experimental passes with the detailer in, and I knew it wasn’t going to be easy. The more I shaved, the more I said stuff like, “I should’ve kept that part,” and “Dang it,” and “Darn it,” and “Dagnabbit.” I really do say “Dagnabbit.” My 6-year-old has started saying it, too, in addition to “Nuts!”—which I don’t say. I did the best I could, but the Batman logo just didn’t materialize the way I hoped it would. I took a picture anyway, which I won’t post now. I think I’ll hold onto it until the inevitable Fail Week here in the Shallows. My wife, however, thinks it’s recognizably the Batman logo—but as my wife, she’s legally required to say that. Successful logo or no, the Movember effort was an unquestionable triumph. Friends, family, and an anonymous donor helped me to raise $375; I came in seventh on my team of 50 guys. That group, Dads/Bloggers, raised a collective $15,797. Boston, the city where our group was registered, netted $1,153,223. That’s one city’s total! The final numbers for the entire effort won’t be in until after April, but there has to be millions upon millions of dollars raised in the fight against testicular cancer, prostate cancer, and mental health issues. Thanks to everyone who supported the effort in any way. 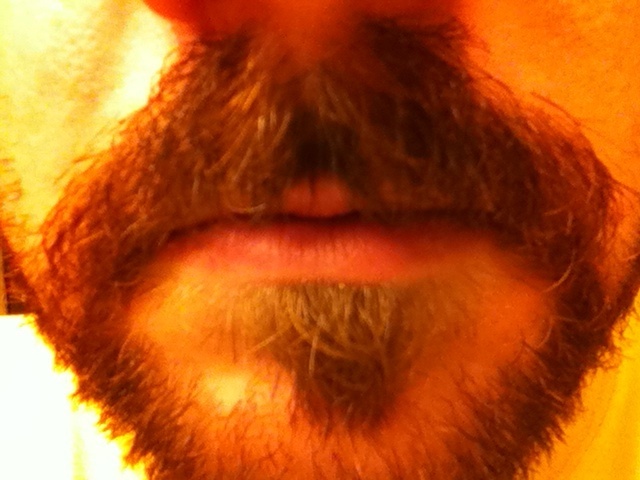 I may reward you soon with a photo of my terrible Batman moustache. 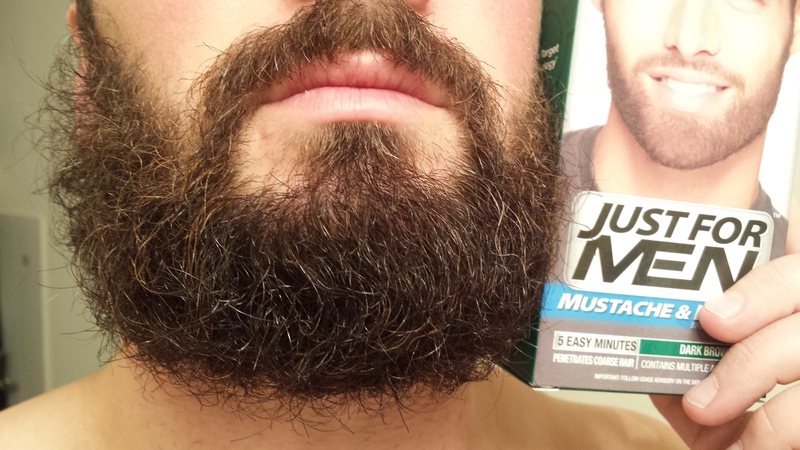 I also probably have some beard/moustache coloring in your shade, so let me know if you want to try some out. Maybe I can lob a box your way. My wife surprised me with a date night alone last night, for which we walked around the local farmers’ market and held hands. We held hands! Normally when we display even a hint of physical affection, one or more of our children will rush in to either get in on it or try to break it up. My middle daughter will literally clamber up my body and stick her head between our faces as I lean in for a kiss. Of course, she’s also held conversations like this when she sees us smooching goodbye in the morning. Her: I hate it when you guys do that! It always takes longer! Wife: But we love each other! Her: Remember when you do it in the kitchen? Oh, I hate that! 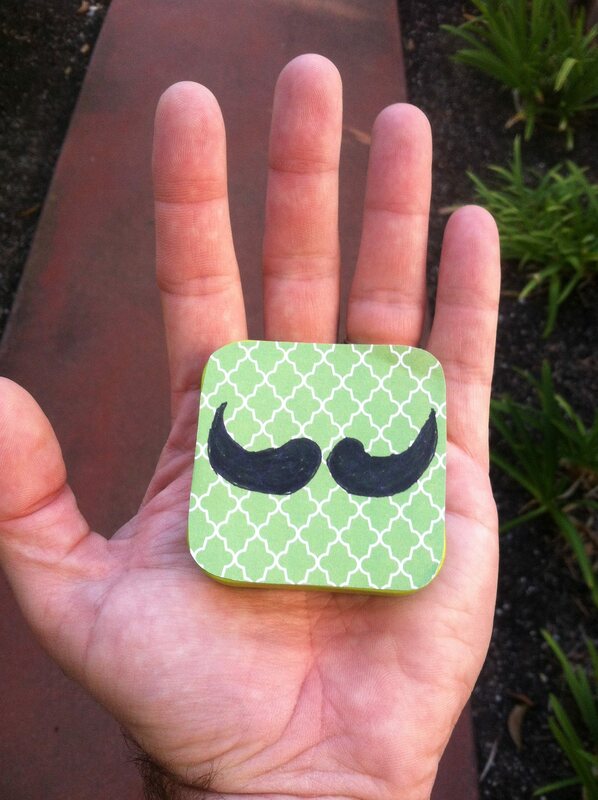 As part of our date, my wife also surprised me with a small tin (you might recognize it as once having housed Trader Joe’s green tea mints) of moustache wax, in honor of my Movember moustache-growing efforts. The wax, I then learned, came from comb I harvested from some bees I helped relocate to a friend’s property about half a year ago, a process that netted me about 25 stings because I’d put the suit on wrong. Since they managed to get into my headpiece, most of the stings were on my neck and throat. I don’t recommend that. It’s like shaving, but with a blade that’s mad at you and wants to cut you over and over again, sometimes even by getting into your shoe and then down into your sock and waiting until you arrive at home to get you one more time. 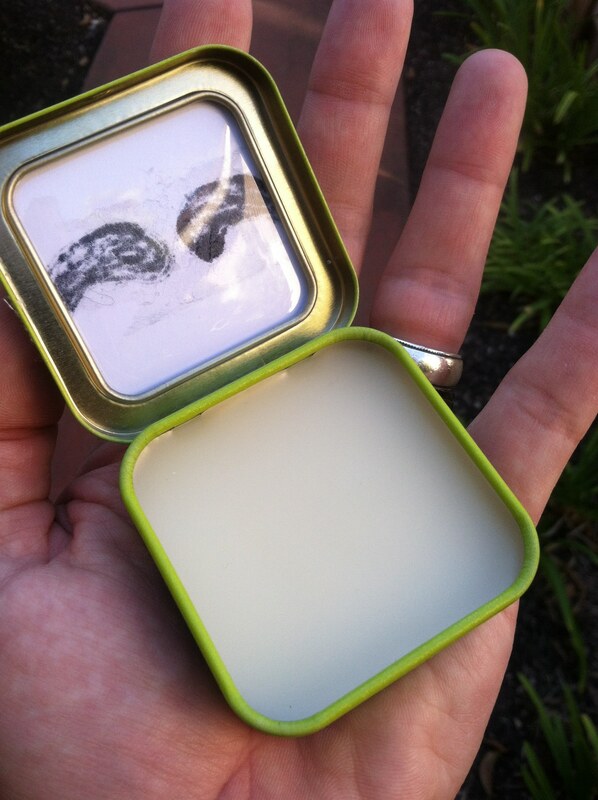 My moustache won’t be waxable for some time yet—probably not till long after November—and she doesn’t really want me growing it out that far, so the tin was mostly symbolic, a sort of “keep it up!” made out of bee vomit and castor oil. Which, really, are two of the most motivating substances out there. Thanks, Wife, for the wax! You may or may not find my chest hair sculpted into the Batman symbol when I take off my shirt tonight! My son has two middle names. One is Atticus, because we like the old-fashioned sound and Atticus Finch from To Kill a Mockingbird is an awesome guy. The other is Michael, because it’s a family name, and my wife’s uncle was an awesome guy. More than that, he was a hero. Mike McGroarty worked for many years for the La Habra Fire Department, ending his time there with a seven-year stint as chief. Then he moved on to become deputy chief of the California Governor’s Office of Emergency Services. He also helped lead the National Disaster Search Dog Foundation, which sends animals into dangerous situations to seek out people in need of rescue. Through his work, Uncle Mike saw things no person should ever have to see, but for him, it was just part of the job. He fought on the side of life, whether his opponent was destruction left by an earthquake or hurricane or rubble caused by an act of terror. He worked to rescue victims of the Oklahoma City Federal Building Bombing, and he coordinated California’s rescue efforts in New York after Sept. 11, 2001. After he was diagnosed with prostate cancer, he continued to fight on the side of life, though this time that life was his own. Despite harboring a disease that constantly sought to break him down, he pushed for positive progress, and he maintained an attitude of success. He died on June 7, 2010, never once backing down from his battle. Even though I felt in my gut that we were having a third girl, I agreed with her. Now, I can’t wait for my son to get to an age where I can tell him about Uncle Mike, and show him photos, because here’s the other thing: Uncle Mike grew and maintained an amazing moustache. A handlebar moustache. A big moustache with waxed points that curled up at the ends. I can’t think of a better Movember inspiration, since the month is all about growing moustaches and fighting prostate cancer. It’s like the effort was started with him in mind. If you want to join me, Uncle Mike, my (clean-faced 1-year-old) son, and an amazing number of men and women around the country and world in raising awareness of and combating prostate cancer, testicular cancer, and mental health issues—if you want to join us in fighting on the side of life—visit my Movember page and consider leaving a comment or making a donation. You can also tell me about the heroes in your life, because I know you have them. It’s time to get serious about my Movember moustache. I considered giving shaping-idea rights to folks who donated to the cause via my “Mo-Space” (yes, that’s what they call it), but instead I decided to open it up to anyone and everyone. Anyone and everyone who reads my blog, that is. 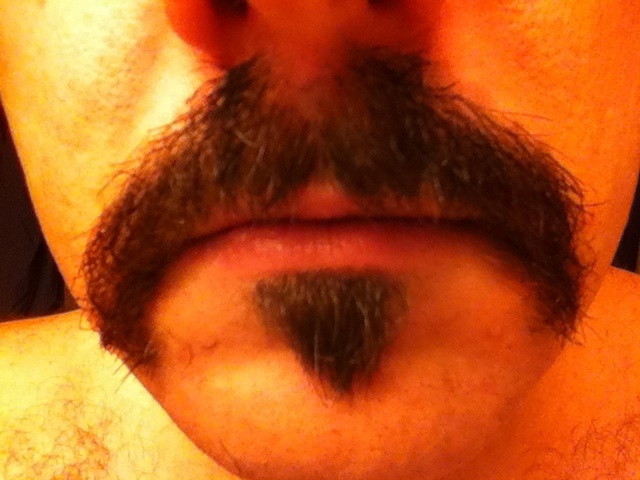 My current front-runner idea is shaving the Batman logo into my upper lip, with help from the soul patch below. I can’t connect anything, according to official Movember rules, because a connection would make it a goatee, and this isn’t Goavember. Like that idea? Have a different one? Let me know, and I promise I’ll consider each suggestion. But make it soon, since I need to take this stubble from an on-the-way full beard to a moustache in progress pronto.